Half of the population of developing countries in Asia, Africa and South America is suffering from a water-related disease. That is the most important reason why the average life expectancy in these countries is only 40 years. In 80% of cases, childhood mortality is the result of drinking contaminated water. If we can help all those people to have clean drinking water, we will save millions of lives per year. A Kitchen sink with water covering fruit serves as a perfect method for using our diffuser stone to extend the life of your fruit. SCOTTSDALE, AZ - The International Ozone Association, says that sanitizing towels, linens and surfaces with ozonated water has been shown to be "extremely effective" in the reduction of the staph infection "super bug" MRSA, a methicillin-resistant form of Staphylococcus aureus which has been spreading across the United States. 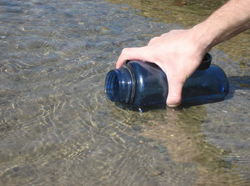 Go from river water to drinkable, SAFE water with ozone processing. Ozone is one of the strongest available oxidizing agents, and is commonly used for the treatment of water in municipal and industrial applications. The special advantage of ozone is in the environmentally friendly way in which it works. without the formation harmful chlorinated by-products. 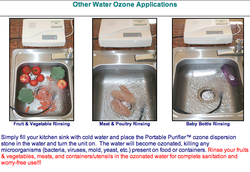 The United States Food and Drug Administration approves the use of ozone for use in food. They state that ozone may be safely used in the treatment, storage, and processing of foods as a antimicrobial agent. The Food and Drug Administration has approved the use of ozone in gaseous and aqueous phases as an antimicrobial agent on food, including meat and poultry. Responding to a petition from the Agriculture and Food Technology Alliance of the Electric Power Research Institute, Palo Alto, Calif., FDA published a final rule that permits use of ozone as a food additive (66 Fed. Reg. 33,829).